February 14th, Valentine’s Day, the day of Love and Romance. Fill your sweetheart’s night up with a homemade treat. 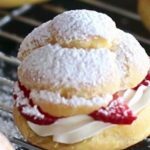 Along with some chocolates, candlelight and a dry bottle of bubbly, these homemade Strawberry Cream Puffs will be a sure thing to get anyone’s heart beating. Enjoy! Remove from heat and add flour. Mix with a wooden spoon until all of the above ingredients are blended together. Return the saucepan to low heat and stir for 1 minute or two to pull out the moisture from the batter and until it pulls away from the sides of the pan. You will see some of the dough sticks to the bottom of the pan. Transfer batter to a large mixing bowl and allow to cool slightly. Add the eggs one at a time, carefully incorporating each into the batter using the wooden spoon. It will result in a smooth, consistent batter which still holds its shape. Fit a pastry bag with a large 1⁄2 inch round tip and pipe the dough into 1 1/2 inch circles on a parchment paper lined baking sheet. Preheat oven to 350 degrees. Bake for 25 to 30 minutes until browned and puffed. Prick the underneath of each cream puff with a skewer to release steam and allow to cool on a wire rack. In a large bowl whip the cream with an electric mixer until it forms stiff peaks. Add sugar and vanilla extract and mix to combine. 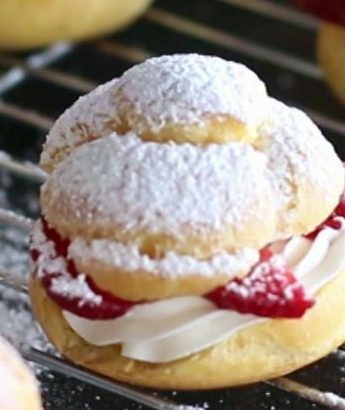 Split the cream puffs in half and fill the bottom half with the cream mixture and the strawberry slices. Place the top of cream puff on top and dust with powdered sugar and serve.